I'm not a very good cooker when it comes to Chinese food especially boiling soups. 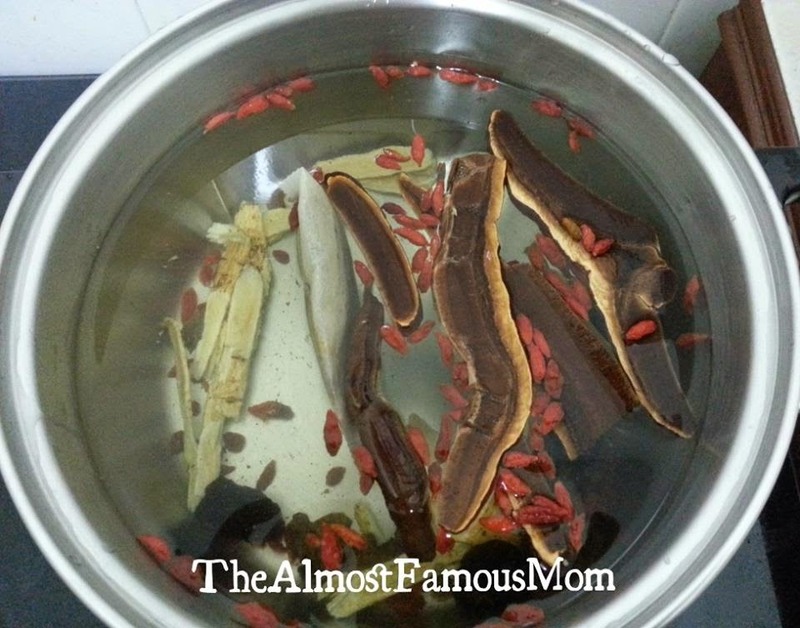 Even my own mom cannot believe I can boil herbal soup...LOL! I am sure this is the work of "motherhood"! My boy is my main motivation that drives me to try and keep trying to fine-tune my skills in boiling Chinese herbal soups. 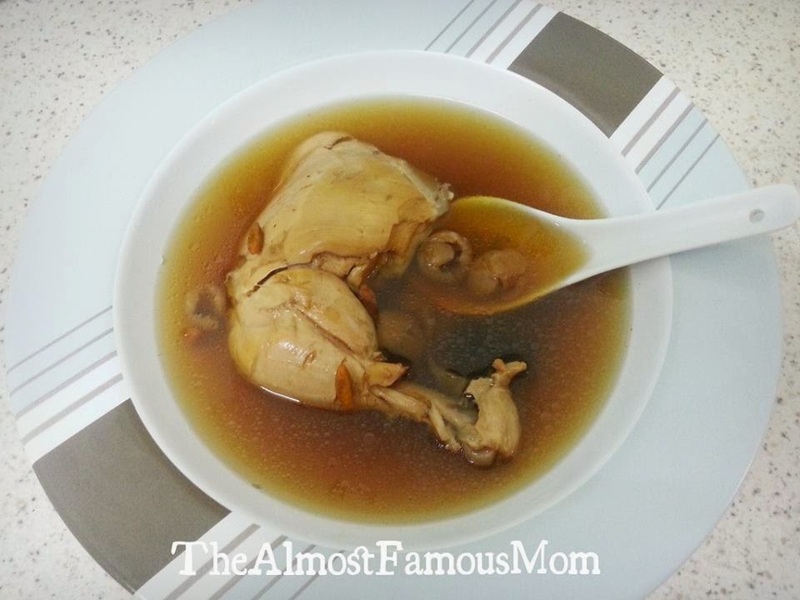 I still remember very clearly his reaction and how he responded the first time I cooked Chinese herbal soup for him, he was only 13 months old. He told me "goot" with his "index-finger up" - that is his way of saying good and thumbs up. 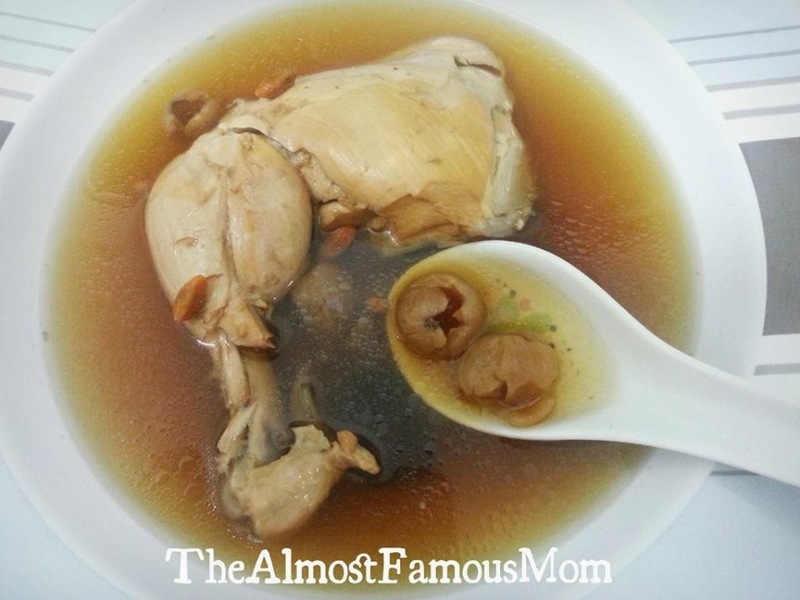 Today's lunch I cooked Lingzhi Ching Pu Soup for my boy. He just recovered from a really bad flu, cough and fever after having taken the Pneumococcal vaccine so I suppose a good bowl of herbal soup will be good for him and to tonifies his body's Qi. The soup has a little bitter taste to it (Lingzhi is slightly bitter) so I have to add a little salt to make it more palatable for him. 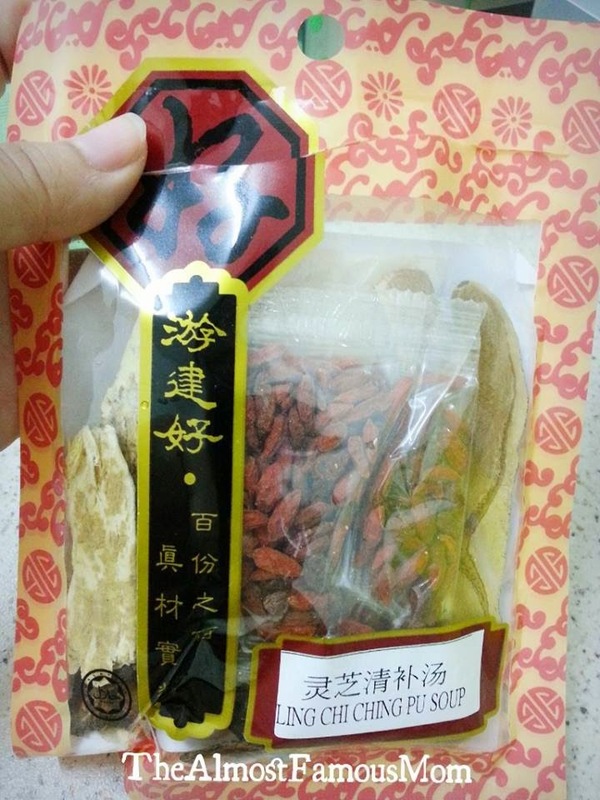 What herbs are found in the package: Lingzhi, Dang Shen, Ginseng, Red Dates, Wolfberries (Goji) and Dried Longan. In the section below I will share the goodness of the herbs used in this soup (extracted from Miraculous Soup by Wu JiLin). Lingzhi is a type a of mushroom, known as the of immortality, it is bitter and neutral in nature. Its effects go into the internal organs and it tonifies the whole body's Qi. It improves overall health, strengthens the immune system, protects the liver and detoxifies. It also calms the heart, strengthens the stomach, expels phlegm and improves blood flows. Dang Shen is sweet and slightly warm in nature. It tonifies the torso, improves Qi and strengthens spleen and stomach. 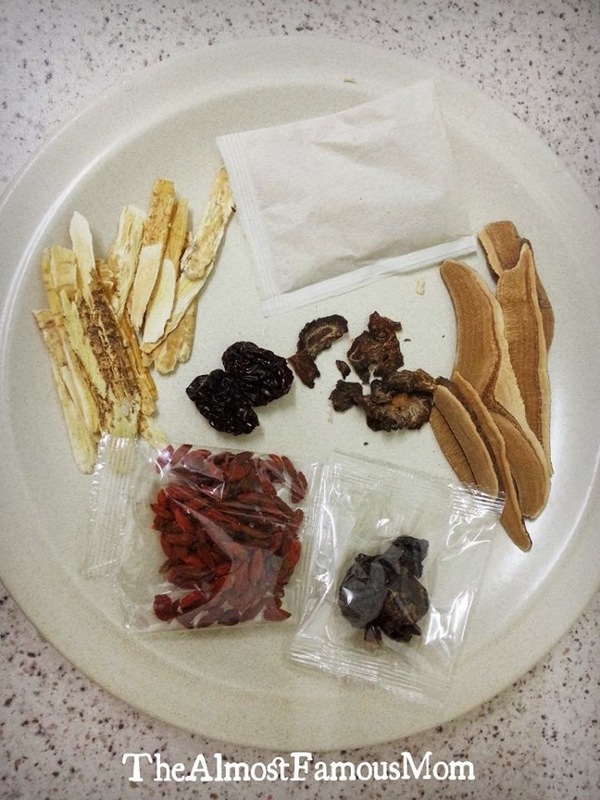 Ginseng has a bitter sweet taste and is warm in nature, ginseng is well-known to rejuvenate Qi and strengthen the lungs. It improves the Yin, moisturizes the body ad is a precious herb. Red Dates taste sweet and is neutral in nature. It replenishes Qi, strengthens the spleen, replenishes blood ad soothes the mind and nerves. Wolfberries (Goji) has sweet and sour taste and it is warm in nature. Rich in polysaccharide and vitamins, it nourishes the liver and kidneys, improves eyesight, heals weakness and fatigue, and strengthens the muscles and bones. Dried Longan is neutral in nature and it tonifies and improves the heart and spleen, nourishes the blood and soothes the mind. Rinse the herbs under running water to wash away any dust residue that might stick on the herbs during the drying process. My TCM (Traditional Chinese Medicine) doctor advised me to never soaked the herbs as the essence might be wasted in the soaked water. After rinsing, boils the soup with 8 bowls of water under high heat. As for the meat, I used a whole chicken leg. Remove the skins and fat. 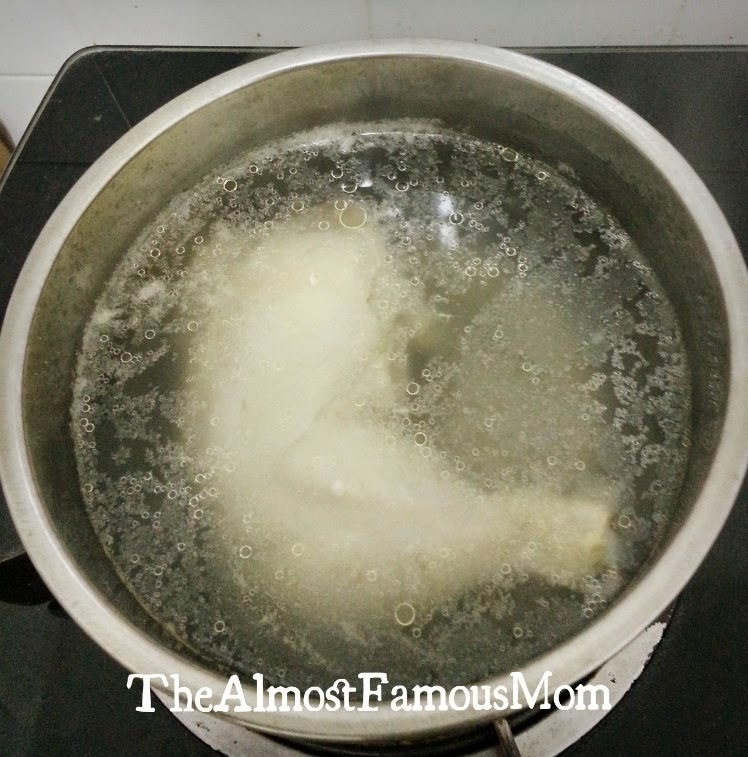 In another pot, blanch the meat in boiling water for about 3 minutes. This is to remove excess fat and oil from the meat then add the blanched meat into the pot containing the boiling herbs. Soup with blanched meat will usually looks clearer and less oily compare to the soup with un-blanched meat. After boiling for about 15 minutes with high heat, turn it to low heat and continue to boil for about 45 minutes. You may add some salt to make the soup more yummier.